I wanted a short trip somewhere amazing. Five hours drive from the Central Belt gets you that. Leave at the time you normally commute to work, and you can be there at lunchtime and still have up to ten hours of daylight to play with. Why don't more of us do this, more often? Previous trips to Kinlochewe and Torridon were concentrated on Munros. Today it was the turn of a couple of Corbetts to the north of Beinn Eighe. 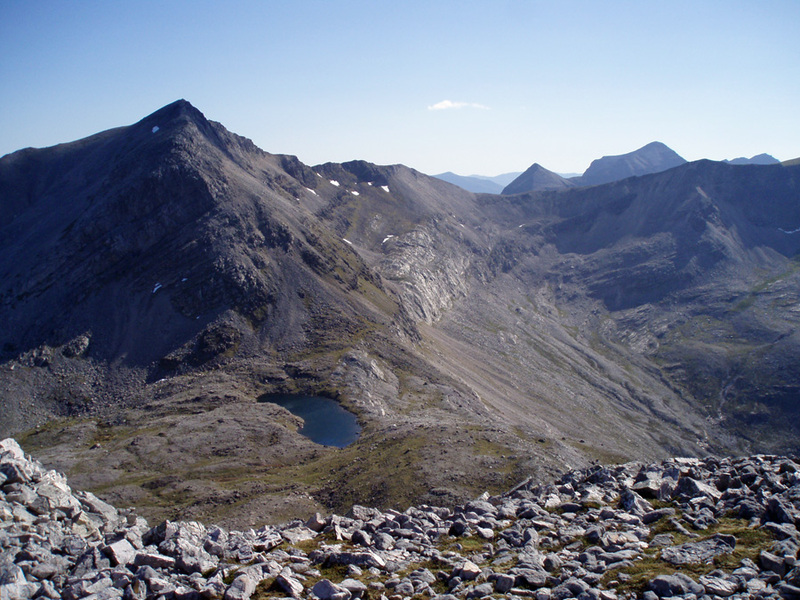 Ruadh Stac Beag is Beinn Eighe's orphan peak, a junior companion to Beinn Eighe's summit of Ruadh Stac Mor, but despite its closeness to the main ridge it is almost never tackled on a traverse of the Beinn Eighe massif due to the drop and reascent required. 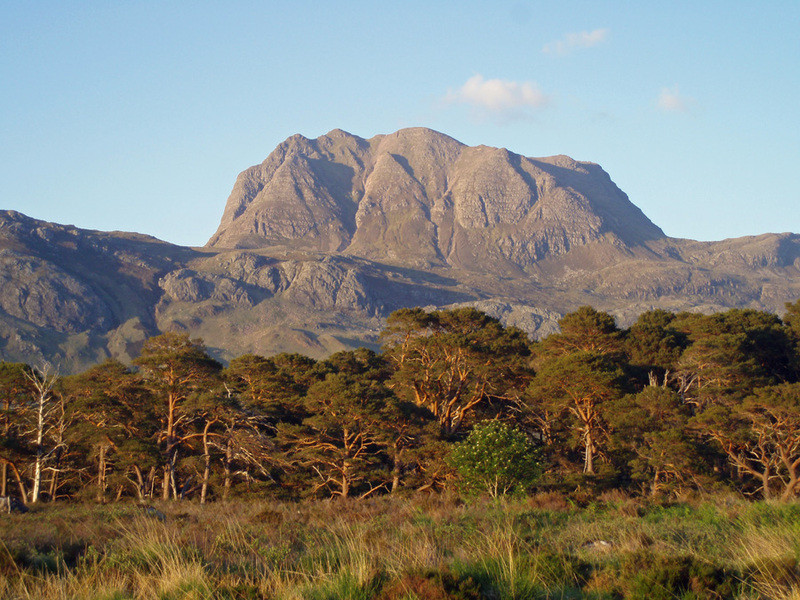 To the north of the wee red stac is Meall a' Ghiuthais, both peaks easily ascended by stalker's track from the oddly named village of Kinlochewe (odd because it should be Kinlochmaree - Loch Ewe is miles away). 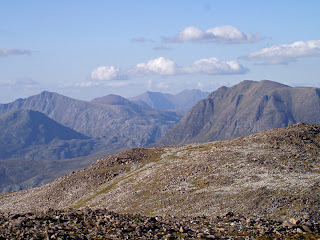 I climbed out my car, donned boots, rubbed on sun cream, and headed off at pace on the hottest part of the day. Moving quickly through the forest trail kept the clegs at bay but this was not the real reason my legs were pumping like pistons up the stalkers path. The real reason was that strange excitement of a new hill on a fine day. The hot squeak of quartzite on quartzite as the stones on the path ground underfoot. Ruadh Stac Beag is a steep knob of quartzite blocks, grey and bright. 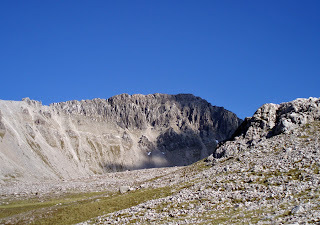 I took the easiest route up a stream to the col between this hill and Beinn Eighe. 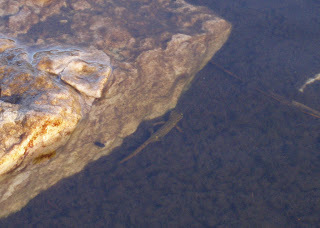 The summit rocks are pitted with what looks like the fossilised shells of sea creatures. Back down the way I came, then as hard as I could up Meall a' Ghiuthais. 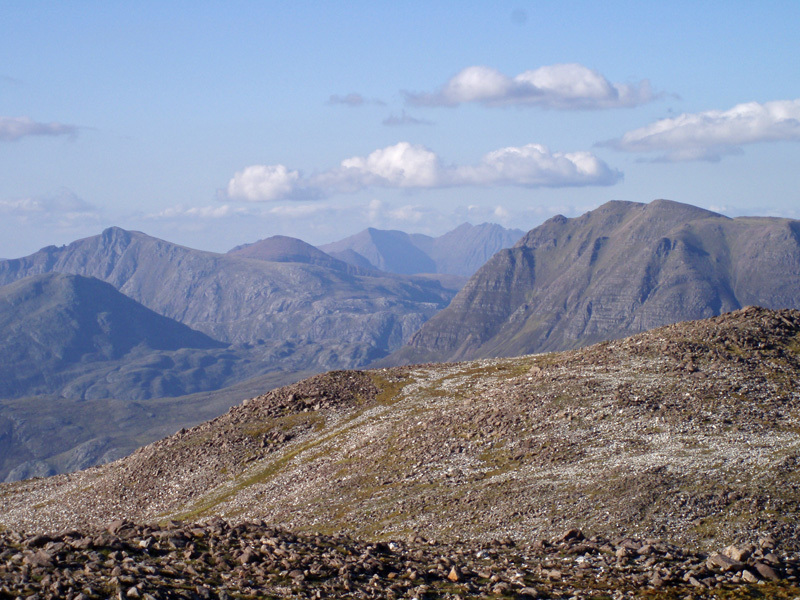 A fantastic view back over to Beinn Eighe and Torridon. Loch Maree gloriously blue and island studded, and An Teallach keeked up behind Slioch. 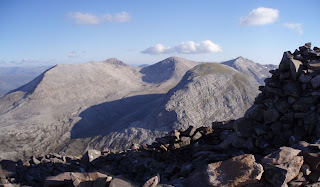 Torridon and sunshine makes for a happy hillwalker, and I was looking forward to a relaxed camp. And in this more expansive frame of mine, the highlight of the day revealed itself. I did not even notice on the way up, so fixated was I at getting my Corbetts, but a small lochan near the path was full of newts! I watched them for over half an hour. This year's short spring is nearly over already: summer is knocking on the door, and it could not have started any better than a weekend by Loch Maree. Will you go anywhere amazing this weekend? 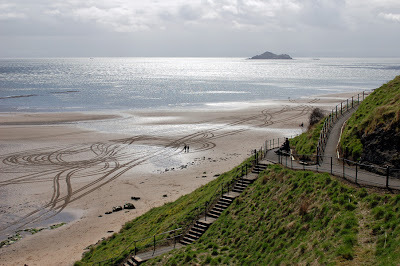 Years ago I did the Fife Coastal Path, and it was a revelation just how enjoyable it was, walking along beaches and low cliffs between picturesque villages. 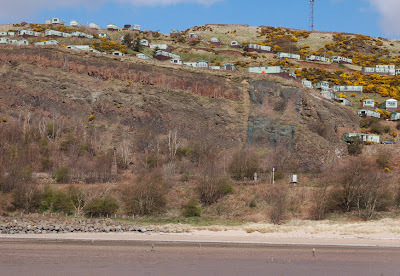 Just once (if you ignore the unavoidable stretch through Methil) does the route take a disappointing turn, when it becomes a road tramp between Kinghorn and Burntisland. 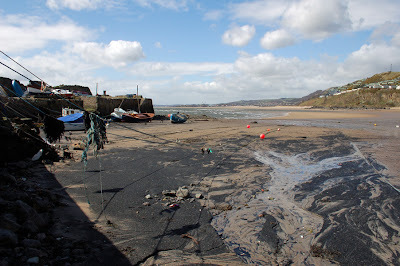 This is because the beach disappears at high tide, but at low tide, the beach is the obvious route between these towns. 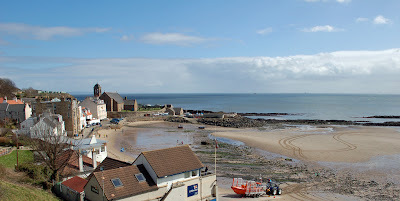 We started lazily at Kinghorn, sheltered from a strong westerly by a steep bank, eating icecream on a bench overlooking the beach, watching the RNLI cleaning the inshore lifeboat and litter-picking volunteers cleaning the beach. Although low tide was not long passed, Kinghorn beach soon petered out into rocks, and after scrambling over these, we ended up at a condemned pier-like structure that looked as if it was about to crumble into the sea at the slightest push. I was not going to walk round the foot of such a tottery structure! A path led us back onto the road - but not before we had been forced to walk through someone's garden. 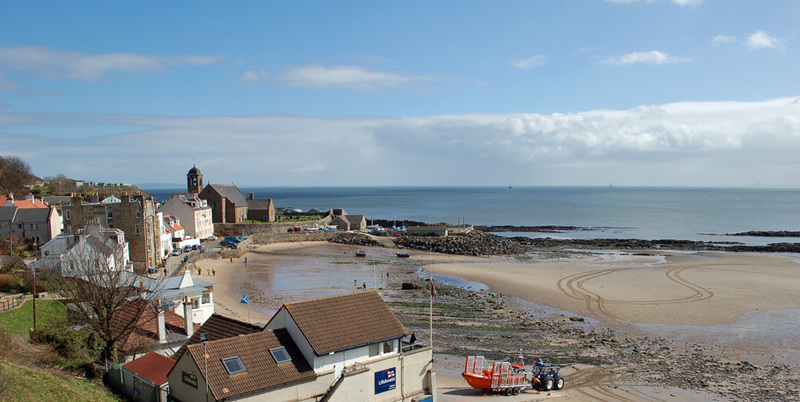 The other side of Kinghorn is called Pettycur, no doubt (like Cellardyke/Anstruther further up the coast) a completely separate entity to Kinghorn whose residents would take umbrage at being confused with Kinghorners. Its picturesque harbour was lined with fishing bothies, boats stranded on the beach waiting for the tide. This beach stretched all the way to Burntisland. From the beach the roadside monument to Alexander III can be seen. 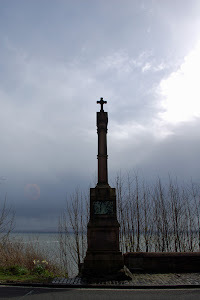 It was at this spot on a stormy night on 19 March 1286, whilst riding from a Parliament in Edinburgh to the more enjoyable state business of creating an heir with his new wife at Kinghorn, that Alexander's horse slipped and he fell down the cliff to his death, just a mile from his destination. 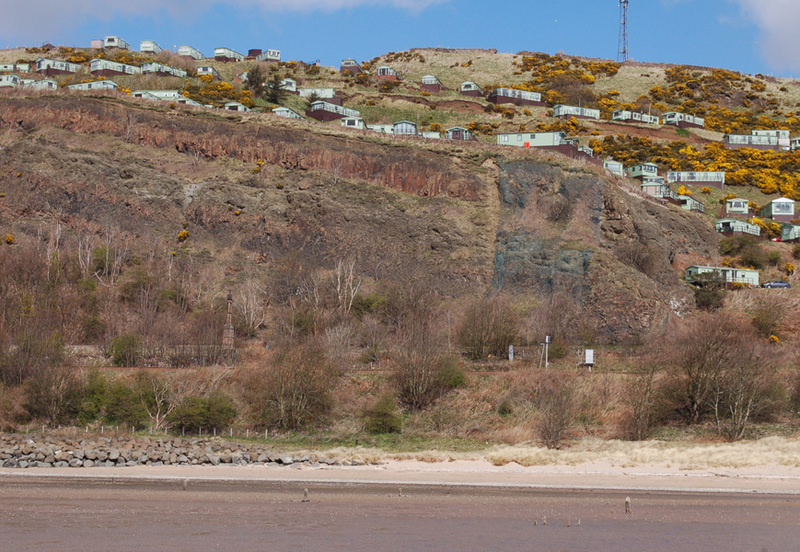 From the beach it is easy to see how this could have happened, the crumbling cliffs today now the improbable site of a caravan park. If only the tide had been out on that particular night so Alexander could ride along the beach! For it was a night that changed history. Alexander and Edward I of England were relatives and friends. But Alexander's death left Scotland without an heir, the nobles quarrelled and threatened civil war, Edward intervened and ended up invading, trying to annexe Scotland for himself. This led directly to 300 years of warfare and bad feeling between Scotland and England. The Scottish economy had been relatively vibrant in the 13th century, but did not recover until the 18th century. And all because a horse slipped. 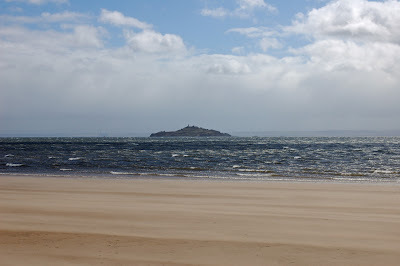 The walk from Pettycur to Burntisland was not as easy as I expected. Sand streamed across the beach like spindrift, getting in the eyes and shoes, and walking forwards was an effort. Offshore, kite surfers enjoyed this wind, and the Black Rock (that we would have aimed for if we had been an hour or so earlier) was already inundated by the tide. With the tide now rapidly rising we did not hang about, and made straight for the sanctuary of Burntisland and its miniature esplanade. I haven't been to a zoo since I was in primary school - I don't like to see animals in cages - but the Five Sisters Zoo near Livingston is a bit different. They take on animals rejected or maltreated elsewhere - exotic pets whose owner can no longer look after them, a lynx with a dodgy ear, and most ambitiously, dancing bears from a European circus - and give them a place where their quality of life will be improved. Thus it was a tragedy when a fire at the zoo in the early hours of 14 April destroyed the reptile and insect house and everything in it. We decided to go along and leave a donation in support. I was immediately fascinated by the marmosets and lemurs, bold monkey-like creatures. Other people have also donated time and money to the zoo's rebuilding efforts. £42,500 has been raised to date, and local businesses such as 1st Choice glazing have offered labour and materials free to rebuild the reptile house. The most amazing story at the zoo is that of three bears, rescued from a life of captivity in a European circus. They now have a large, mostly woodland site, and a private indoor area to get away from gawping people. I hadn't realised how much I would enjoy visiting a zoo and before we knew it, it was closing time - had we really been here for three hours? !